Regency robe à la Polonaise of cherry-colored satin. Home » Regency robe à la Polonaise of cherry-colored satin. Afternoon dresses, Robe à la Polonaise, January 1795. Heideloff`s Gallery of Fashion January 1795. England Afternoon dresses. The hair dressed in light curls; chignon turned up plain, and the ends returned in ringlets. Chiffonet of white satin, two white ostrich feathers and a large diamond pin placed on the left side. Lawn petticoat embroidered in gold, and trimmed with a black and gold fringe. Robe à la Polonaise of cherry-colored satin, bound with black velvet, long sleeves; olivets and chain down the back; handkerchief within the gown behind, drawn out in the front, and fastened by a-belt. Three strings of beads round the neck. Diamond ear-rings. Swan-down tippet. White gloves, and white shoes, embroidered and trimmed in gold. The toupee dressed in light curls; plain chignon. Twisted turban of blue and white cross striped satin. One white ostrich feather placed in the front. 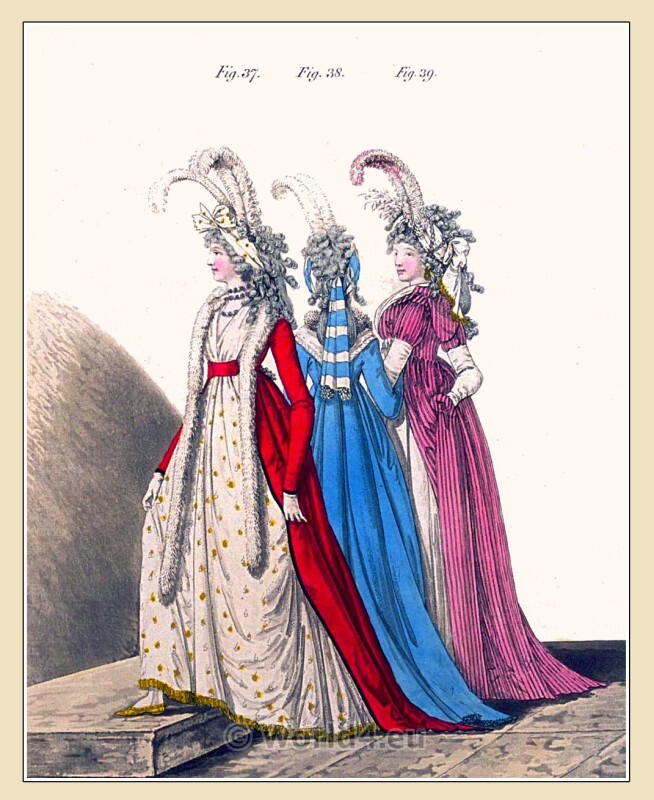 Robe à la Polonaise, with long sleeves of sapphire blue poplin. trimmed at the wrists and at the bottom with black lace, and down the back with a black net lace chain, and blue and white olivets. White lawn embroidered handkerchief. Blue fox fur tippet. The hair in light curls; chignon turned up plain. Chiffonet of white satin, the end trimmed with gold fringe, on the left side looped with a black gem netted chain. One white curled ostrich feather, the edges dyed in purple, placed on the left side, and a bunch of vulture feathers spotted with chenilles in the front. Plain lawn petticoat. Robe of black and pink striped satin; the long sleeves of white satin. Lawn handkerchief within the robe. Gold ear-rings. Gallery of Fashion. Vol. 1, April 1794 To March 1795. Published by Nikolaus von Heideloff, London. This entry was posted in 1795, 18th Century, England, Gallery of Fashion, Georgian period and tagged England Georgian Era Fashion, Neoclassical dresses, Nikolaus von Heideloff, Regency period on 7/30/13 by world4.